At Holidaysafe we understand that shopping for travel insurance can be a stressful process – with so many providers and options available, which can you trust to look after you in the event of a holiday disaster? That is why we are so grateful to all the amazing Holidaysafe customers who take the time to leave US their feedback about our products and services each month. Holidaysafe currently has an ‘Excellent’ customer satisfaction score on Trust Pilot, scoring and average of 9.0/10 for our sales, Claims and Emergency Assistance services. Miss Butters gave Holidaysafe a full 5/5 star rating and left the following comments; “Holidaysafe annual insurance – I have taken out an annual policy with Holidaysafe for a few years now and would recommend them. They provide very good value for money. “On behalf of the entire Holidaysafe team I would just like to thank Miss Butters once again for her great comments, and for taking the time to leave us her feedback. 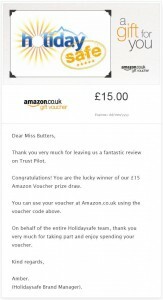 If you’re a Holidaysafe customer who would be interested in winning a £15 Amazon voucher, simply visit our Trust Pilot Evaluation page and leave us your honest feedback. Once your review is posted your name will automatically be entered into the prize draw for that month, and we could be contacting you next!